I can connect to my Mac using ssh from the windows machine: ssh [email protected] works. 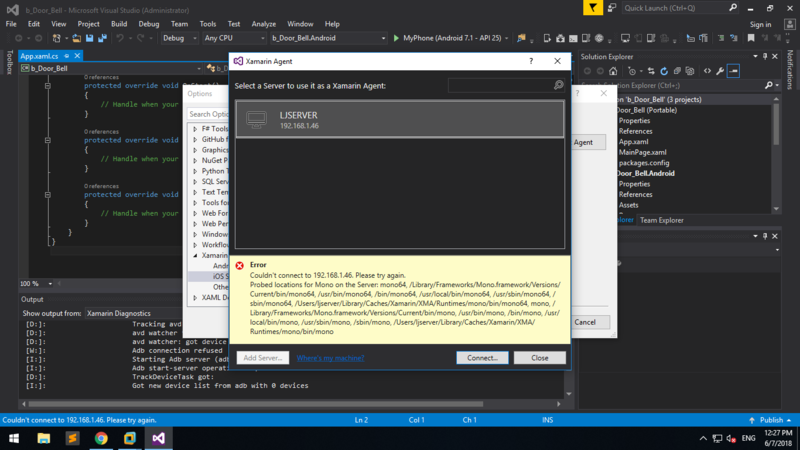 Xamarin.VisualStudio.Remote.State.DisconnectedState|Error|0|Invalid credentials. Please try again. Xamarin.Messaging.Ssh.Exceptions.MessagingAuthenticationException: Could not authenticate the user MYUSERNAME with the provided credentials ---> Renci.SshNet.Common.SshAuthenticationException: No suitable authentication method found to complete authentication (publickey,password). Deleting the XAM folder in both the MAC and the PC in the Local/Temp/Xamarin folder did the work. Don't forget to install XCode and Android Studio (or Visual Studio for Mac). Both are necessary to run on iOS. I've actually repaired Xamarin's stuff and sent it back to them for some time. In 2014 they shipped the first versions of Visual Studio support, including project templates. At that time even their"Hello World" template was broken. I couldn't direct potential customers to their examples, since most were broken. I had to fix a set that I could demonstrate to customers. It's sad that this state of affairs continues - I just had similar problems about the build server on VS2017. The lack of quality control is allowing things like React Native to gain traction. I know many folks who have switched to it, sadly. So just to add another thing to try if you run into this issue. That I didnt see documented anywhere else. In a 64-bit version of Windows Vista, Windows Server 2008, Windows 7, or Windows Server 2008 R2 you need https://support.microsoft.com/en-us/help/2588507/error-messages-when-a-32-bit-application-has-the-largeaddressaware-opt to get the connection from VS to Mac working. Using the IP address worked for me. Also I had to be logged in my Mac using the same credentials as in VS.
error while connectin to mac . mac in installed on VMWare .